The Ultimate Performance Enhancing Multivitamin Supplement*. Loaded with Highly Bioavailable Vitamin Cofactors and High Doses of Beta-Alanine and L-Carnitine L-Tartrate*. Anavite is far beyond a mere high potency multivitamin*. It’s really three supplements in one*. A high potency athlete’s multivitamin/mineral formula with optima, clinically validated doses of Beta-Alanine and Carnipure (L-Carnitine L-Tartrate) for vastly increasing endurance* and nitric oxide levels* while reducing recovery time*, thus optimally increasing aerobic* and anaerobic athletic performance*. Fully loaded with highly bioavailable vitamin cofactors such as methylcobalamin and powerful minerals such as methlyselenocysteine you can expect that Anavite will exceed your expectations in a high potency multivitamin & mineral formulation*. To raise the bar even further, Gaspari researchers including 2 full grams of powerful recovery aide Carnipure (L-Carnitine L-Tartrate) which has also been shown to increase vasodilation*, nitric oxide levels* and increase androgen receptor density*. 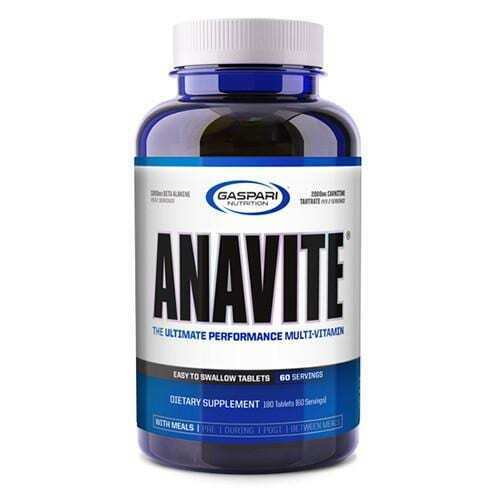 Lastly, while other companies under does beta-alanine, Anavite includes over a full 3 gram daily does of this powerful amino acid which is the dosing threshold clinically shown to increase both anaerobic and aerobic performance*. This means you can train hard for longer*! You see, both carnitine and beta-alanine are both best taken daily*, just like your multivitamin so why not combine them into one powerful daily supplement formula at a cost effective price? We guarantee, Anavite packs a potent array of ingredients at full doses* true athletes require to meet and even exceed their performance and recovery demands*. Who else but Gaspari Nutrition would give you three distinct supplements revered by educated athletes everywhere-all for the price of one. Anavite Athletic Drive Matrix: Carnipure (L-Carnitine L-Tartrate), Beta-Alanine, Boron*.